When you think of archaeology, perhaps you think of digging in the ground for things made before people wrote anything down. And the word ‘history’ might call up the image of handwritten papers hidden in archives. Yet so much that is important about our past falls in the crevices between these domains. Luckily, good scholars from all disciplines have long realised this. They have braved the forces that keep them within their disciplinary boundaries. They have studied the things in between – not just since the latest MacArthur award, as that jury report suggested, but for many years. The truth is, the most interesting things are often not be found within disciplines, but in between. From all sides, we have to make an effort to figure out what is important. And we need all the tools we can lay our hands on (anthropological, archaeological, geographical, historical, sociological…) to understand how things work, no matter whether we call ourselves historians or something else. The challenge therefore is not to start to study objects, as the MacArthur Foundation claimed; it is in how we use objects as sources, as data, as bits of information. And things get really exciting (in my opinion) when they bring us straight back to how individuals in the past lived their lives. Secondly, the way things wore out or broke down can reveal how often they were used and in what circumstances. Many 19th-century and early-20th-century Europeans aspired to a fancy room in their homes. But did they ever use it? As you would expect, the actual living came to be done in the kitchen. You or your parents may remember sitting up in the drawing-room on Sundays, bored and afraid of breaking a china teacup. It’s the ugly and chipped crockery and furniture – the things that you don’t normally get to see in museums – that really tell the story of everyday life. Take a look at the passport displayed at the top of this page, for instance. If it had been your own expired passport, you might throw it away. So we are lucky to have this proof of how intensively it was used by its owner, an early-19th-century Dutch traveller. It was taken out of his pocket and handled by customs officers all over Europe in almost every city he travelled through. However, it is when we want to know not just how people went about their everyday lives, but how they liked it, that things become tricky. When we see a photo of a 19th-century ‘slum’, for example, many of us are trained to consider this environment dirty and uncomfortable. But this judgement has been passed on to us by the busybody elites that tried to gain influence over working areas of town. What we want to know is, on the contrary, how the inhabitants themselves of those workers’ quarters experienced their lives. It is quite plausible that for a great part of their everyday activities they were perfectly at ease there. But without recourse to their writings (and they did not leave many on the topic of interior decoration or city planning), it remains hard to tell. How should we deal with this problem? One non-textual strategy would be to again take a look at practices. People modify their environment when they are dissatisfied with the way it looks. So because photos of workers’ quarters show that workers did decorate their homes (with plants and prints, a.o. ), it is reasonable to conclude that the people living there cared about their homes and had some power to adapt them to their own liking. Another strategy works for those things that we believe have not changed too dramatically over the course of history. Our bodies might be one such area, at least partially. If it is not too frivolous to assume, for instance, that the 19th-century British left foot was different from the right foot like it is today, what to make of the fact that before the 20th century, many left and right shoes were exact copies of each other (this seems to be an example)? Even (ladies’) walking boots did not distinguish between left and right. If we, again, may assume that feet could ache in the same way as they can now, we (whether ‘we’ are art historians, archaeologists, or whatever) may have learnt something about 19th-century walking experiences from looking at an old shoe. Anna P.H. Geurts is a Research Fellow at the Department of History. You can read more of her work in the columns of Historian at large. This contribution was based on work she presented at the British Society for Eighteenth-Century Studies Annual Conference and in her doctoral thesis. Passport belonging to Baron W.H.J. van Westreenen van Tiellandt, 1833, now in the wonderful Museum Meermanno/Huis van het Boek, The Hague, 70/154-161. Photo by Geurts. 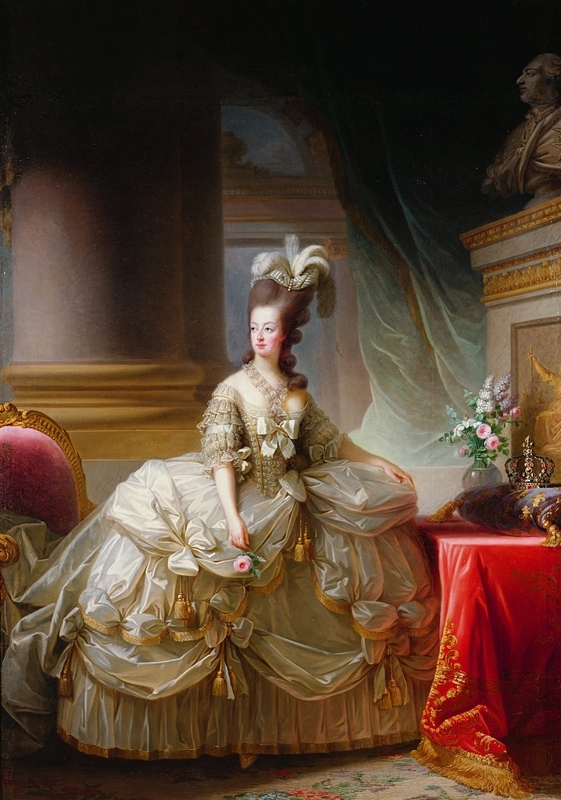 Louise Élisabeth Vigée Le Brun, painting of Marie Antoinette, Wikimedia Commons. Jacob Olie, photo of the Amsterdam alley Gebed zonder end, 1892, from the amazing Amsterdam city image base.